I last blogged about the 2008 vintage of this wine. So when I saw it back on the list I gave it a try. Dark in color with a milder nose of dark berries. On the mid pallet the wine displays some dark berries to match the nose. Even some blueberries. On the medium length finish the wine displays some lovely black berries that stick around in the mouth along with some mild tannins and some acidity. This is a good wine, but after how good the 2008 was this is milder for sure. I would give it an 88-89. Very nice. 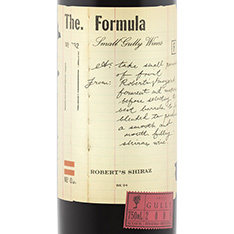 Sourced from 40-year-old vines, this wine has unquestionably nailed the formula for success. A perennial customer favourite, this powerfully built Shiraz will offer up rich dark fruit and big ripe tannins. A hefty and unabashed wine that will work very well with grilled or roasted meats.